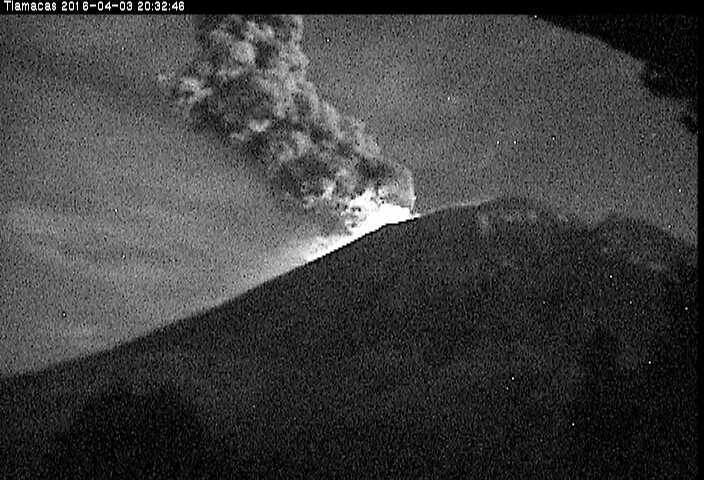 Popocatépetl (Central Mexico): The volcano had a relatively strong explosion yesterday evening at 20:31 local time. It produced a 2 km ash column and ejected incandescent fragments that landed in to up to 3.5 km distance on the eastern and southeastern flanks, igniting some bush fires on the upper slopes of the volcano. An overflight on Saturday with the help of a Federal Police helicopter showed that yet another cycle of dome growth and destruction has recently completed at El Popo (and a new one is about to begin): during their survey, CENAPRED scientists observed that the most recent lava dome, which had been growing since January and lately contained up to approx. 2 million cubic meters of lava, was missing, obviously destroyed by the volcano’s recent series of explosions. In its place, a new inner crater approx. 50 m deep and 325 m in diameter was seen. Likely, the near future will see another dome growing inside it. Turrialba (Costa Rica): A small, probably phreatic eruption occurred at the volcano’s crater yesterday morning at 09:00 local time. The explosion, which lasted 30 seconds, produced a small dense ash plume that quickly dissipated. Villarrica (Central Chile): A small lava lake is active inside the volcano’s summit crater. Vigorous degassing produces violent convection and occasional explosions that eject liquid lava spatter outside the inner pit crater.